Quick catch up: Ramsay killed Roose, the king of the Iron Islands is dead, and Jon is alive. Beyond here there are spoilers for episode 3. Ye be warned. Let’s proceed with the episode! Now, the third episode of any Game of Thrones is always a pinnacle episode, but it feels like the showrunners might have overdone it last episode so who knows what’s going to happen this time around. We start off with Davos finding a living, breathing, no longer blue, still naked Jon sitting up. The wounds from his assassination are still fresh on his body, and he is reeling remembering how he got them. Davos wraps Jon in his cloak while prodding him about what he remembered. Melisandre doubled down on the tough questions by asking Jon where he went after he was dead. Turns out it’s just black, or at least for Jon it was. He saw nothing. 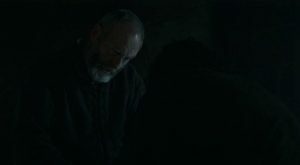 While Melisandre tries to give Jon comforting words about the lord of light wanting Jon to be alive, Davos sends her out of the room in order to help Jon cope with his newfound life. and adds that she trusts him because he’s the father of her son (metaphorically speaking).We’re now taken to a scene where none of the characters are recognizable. A blonde man is sharpening a sword as other men on horseback approach. Another man with dark hair and a Targaryen crest on his chest piece picks up a helm. In the distance, Bran and the Three-Eyed Raven (here on will be called TER) are watching from afar. It’s now plain we are seeing a vision on the past. Bran identifies a young Ned Stark, while TER points out the man next to him is Meera’s father, Howland Reed. One of the two men is identified as Sir Arthur Dayne, The Sword of Mourning, one of the best swordsman in Westoros. It’s then we find out Aegon and Rhaegar are both dead at this point. 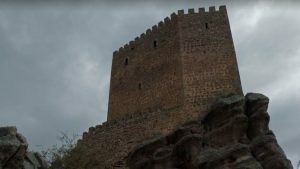 Book-readers know that means Ned is standing in one place now, and that place is the Tower of Joy, the “prison” where his sister Lyanna is being kept. The two men decide to fight Ned, with the Sir Arthur duel-wielding. Two of N ed’s men are easily dispatched but Ned manages to kill one of the two Targaryen guards. Now there are several men fighting the duel-wielding swordsman. Sir Arthur holds his own against 4 men, deflecting blows he can’t even see. He dispatches of two of the men, leaving only Ned and Howland. He kills Howland, leaving only Ned. The fight is grueling, and Ned is disarmed. 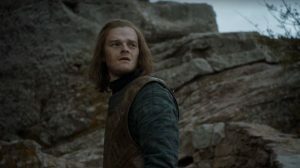 Bran tells the TER he’s heard this story, and that Ned wins but Ned is disarmed and faces death when Howland, barely alive, stabs the Sir Arthur in the back.Ned takes the Duel-Wielder’s sword and slashes him across the chest, killing him. Bran learns the hard way that his father’s war stories were stories, and didn’t always reflect the truth. Moments later we hear a woman scream from the tower. Bran wants to know what is in th e tower, but the TER insists they go. Bran calls out to his father and it appears that Ned hear him. I wonder if later on he’ll be able to affect the past in more tangible ways than just audibly. Bran tries to follow but the TER stops him.Bran is angry the TER has ripped him from the past again. He like any teen would, rebels against the TER who only seeks to educate and train Bran properly. He tells Bran that he won’t end up an “old man in a tree,” but before he leaves he must learn everything. We switch over to the D othraki hoard. 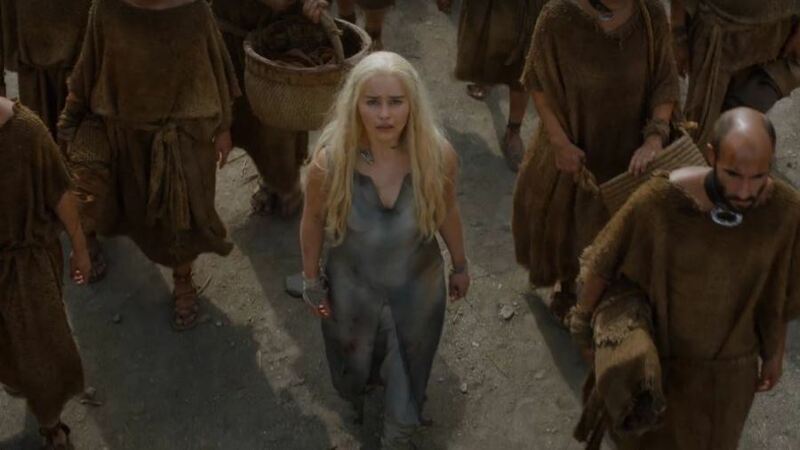 Dany is no longer in chains, but she’s not exactly treated with respect either. Walking beneath two enormous sculpted horses, she has arrived at the place where Khaleesi retire. The Khal welcomes her home, although it’s pretty apparent on her face that this is the last place she wants to be.The women inside strip Dany of all her clothes and her kickass dragon necklace. After being giving a simple dark brown smock, she tells the woman who I will call Den Mother because she hasn’t been introduced, that they’re making a big mistake by keeping her there. 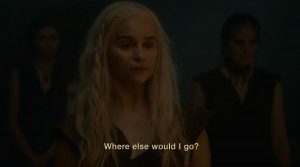 Den Mother questions Dany as to why she didn’t show up when Khal drogo died cause you know, screw your aspirations as a young woman, your husband is dead you no longer have a life. Which is pretty much what she tells D any, if she’s “fortunate enough to stay” with them. Turns out because she went out into the world, her fate is to be determined by a group of Khalasar’s.Varys fans himself on the stairs where Dany once ruled from, if the fan wasn’t enough of a hint, his face screams that it’s boiling hot. Enter, the female spy who helped in the death of one of the Unsullied. Varys asks to speak with her alone, and gets right to the point. He knows who she is (her name is Vala), and what she’s done. Vala gets right to the point too, she thinks the Unsullied and the Second Sons are foreign soldiers brought by a foreign queen to trample on the city’s traditions. Varys fans himself on the stairs where Dany once ruled from, if the fan wasn’t enough of a hint, his face screams that it’s boiling hot. Enter, the female spy who helped in the death of one of the Unsullied. Varys asks to speak with her alone, and gets right to the point. He knows who she is (her name is Vala), and what she’s done. Vala gets right to the point too, she thinks the Unsullied and the Second Sons are foreign soldiers brought by a foreign queen to trample on the city’s traditions.